KLS GIT invited for the International academic tie-up with Japanese University as a part of Global Based Project Learning (GBPL) Program by Govt. of Japan. Only two institutes from India have been selected for this special honour viz. IIT, Guwhati and KLS GIT. Karnataka Law Society’s Gogte Institute of Technology (GIT) Belagavi is selected for the prestigious Global Based Project Program (GBPL) launched by the Government of Japan. This program is basically on Industry V 4.0. Under this, many academic, research and hands on activities like International Student Exchange Program, Internships, Projects and Certification Course have been planned. 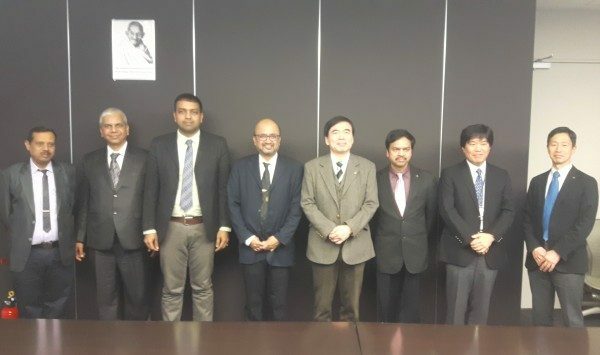 Academic delegation from KLS GIT comprising of the Principal and Deans visited Japan recently and held detailed discussions with the President and Professors of Shibaura Institute of Technology, Tokyo about the Academic and Research tie-up. As per the MoU, Selected Students from GIT would be spending a few months at Tokyo for Research Internship as a part of engineering studies. Also Communication Engineering, Robotics and Intelligent Systems, Info.Tech., Materials, Civil Engineering and Architecture are the few of the areas where in, GIT students would be collaborating. As a part of the MoU, the students will be waived off the fees for the course. Also, recently a group of students and teachers spent a few days at Shibaura Institute of Technology, Tokyo for the GBPL programmme on Industry V 4.0…All expenses borne under Fellowship from the Ministry of Science and Technology under Sakura Science and JASSO, Government of Japan. Every year… few students will be deputed as a part of this program. This Program definitely helps the students to get the global exposure on recent developments in engineering and technology. Also, the participants will grasp how to effectively create new information and communication systems using these four technologies and how to implement the systems into the society, and finally will learn the research scheme to generate technological solutions.